Tanikawa Shuntaro (1931- ) has been, in the world of literature, virtually a household word since the publication of his first book―Two Billion Light-Years of Solitude―in 1952. Generations of students have encountered his poems in textbooks―and still do. Accolades and extensive exposure in the United States, Europe and Asia have followed. Today, at seventy-eight, his creative resources remain apparently, inexhaustible. 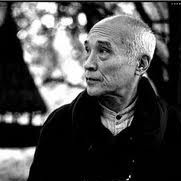 For quantity, quality and variety in poetry he is one of a kind in the history of Japanese poetry. Former Kanto Gakuin University translator-colleagues William I. Elliott and Kawamura Kazuo trace their ‘Tanikawa’ roots back to 1967. Of the fifty-odd Tanikawa volumes they have translated, some fifteen have been published to date. Tanikawa’s 62 Sonnets + 36 appeared in 2009 (Shueisha) and I is scheduled for 2010 (Vagabond). Poet and translators have served on the editorial board of Poetry Kanto since its inception in1984.